after last week’s build a better meeting (one-on-one) blog, matt guevara tweeted me saying that he had read several articles about scheduling a regular time to meet with yourself. 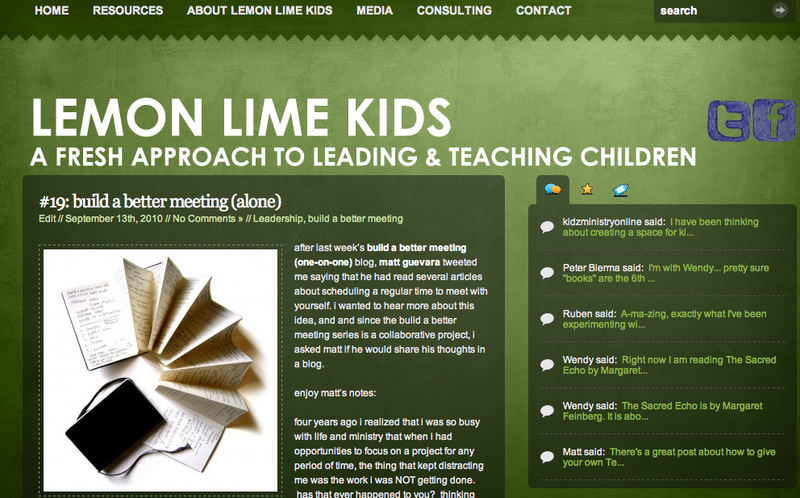 i wanted to hear more about this idea, and and since the build a better meeting series is a collaborative project, i asked matt if he would share his thoughts in a blog. i set a time on my calendar (typically 50 minutes) every week to reflect on a complete, current, and consistent inventory of my commitments. this includes projects i am invested in, upcoming ministry events or speaking opportunities, family related events, and personal items. i hold the meeting in an uninterrupted space. i resist the temptation to stop the meeting and attend to some of the action steps that i uncover (unless they take less than two-minutes). i reward myself for getting through the meeting. Process and organize – anything you’ve collected but haven’t handled yet. Review your active tasks – are there any to add, delegate, defer, or delete? 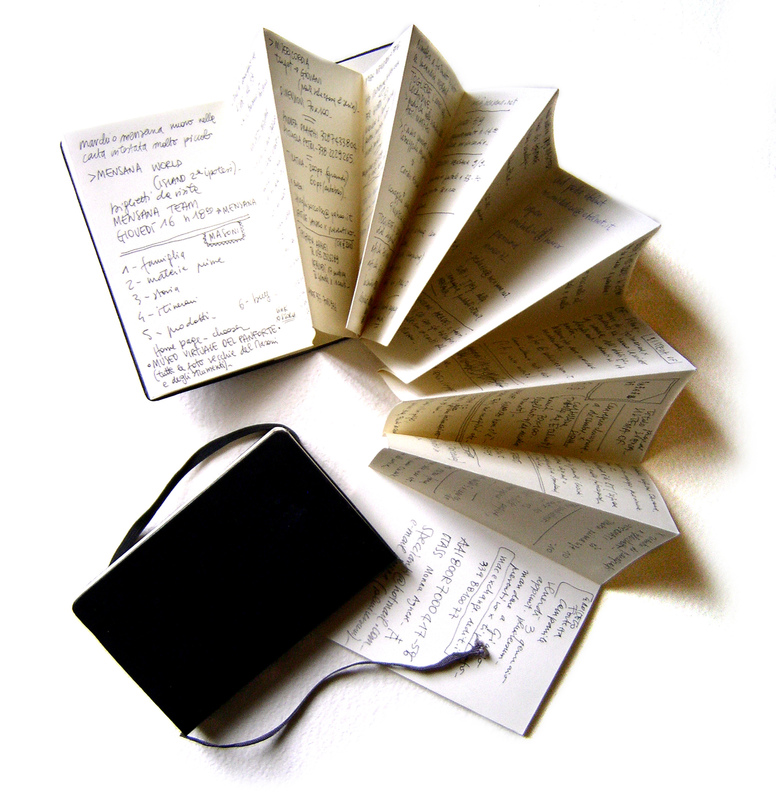 Review your active projects – are there any to add, delegate, defer, or delete? Review your calendar – are there any meetings to add, delegate, defer, or delete? Someday/Maybe – anything to add or promote to an active project? Reference Files – anything you need soon? Anything to add or update? Goals – are you moving in the right direction? Are you making progress? Are any changes necessary? i know, it’s monday. set a meeting with yourself right now for the end of this week. you’ll find that this review time will set up your weekend nicely and provide a great foundation for you to get stuff done next week. 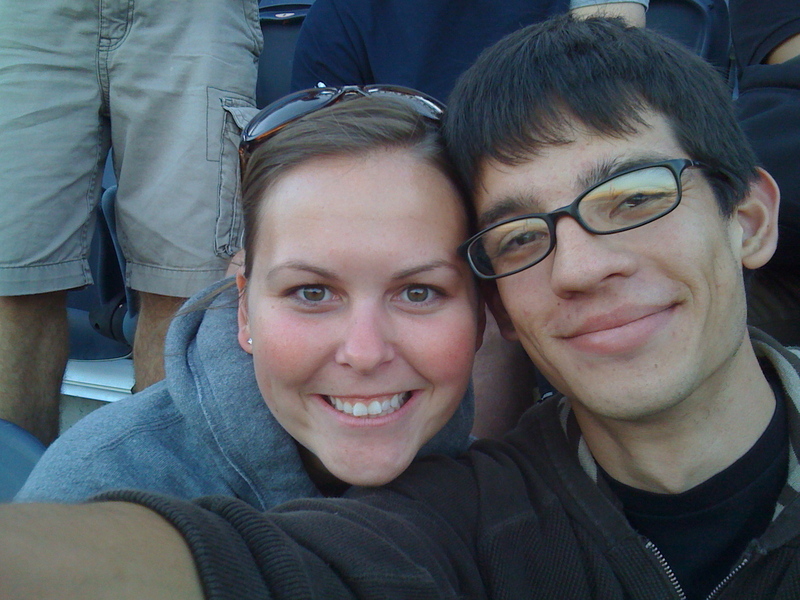 matt guevara blogs at the cory center and is always tweeting about children’s and family ministry. he’d love to meet you (when he is not meeting with himself)! 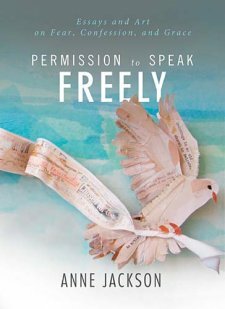 yesterday, i posted a short review on anne jackson’s new book permission to speak freely.the book’s central theme is that we’ve lost our way in the church in not allowing for a place of sanctuary, a place to share our confessions and brokenness, instead becoming a place of shame and fear. i think anne’s right. especially for church leaders. until recently, i believed that being a leader meant hiding my weaknesses, ignoring my insecurities and proving to my team that leaders have it all together. this is not true. of course, it would be great if leaders could always demonstrate confidence and a well-balanced life, and joy in ministry. but that’s not real, and most days not what it feels like to lead. and so, i’m grateful for anne jackson’s voice encouraging us, the church leaders, to lead by sharing both our broken and redemptive story. and so, my own sort of personal confession. a few months ago, i did something crazy. and wild. i cleaned out my closet. and by “cleaned” i mean i got rid of every piece of clothing that hung in my closet. because i worry a lot about what people think of me. and i worry that they think i’m not good enough. and i like to balance those fears with a nice healthy dose of image management. and clothes were my way of managing my image. different clothes for different occasions. always choosing the right clothes so that people thought the way i wanted them to think about me. that was up until recently when i realized all of this, and decided that i no longer wanted to choose clothes based on fear, i wanted to chose clothes that made me feel beautiful, and comfortable, and were just right for me. no one else, but me. so i cleaned out my closet, donated 6 large bags to goodwill, and sold 6 large bags to a local thrift store (12 bags is a lot of fear and insecurity!). and i started over. bought a small amount of new clothes one piece at a time, only things i absolutely loved and that make me feel truly like me. 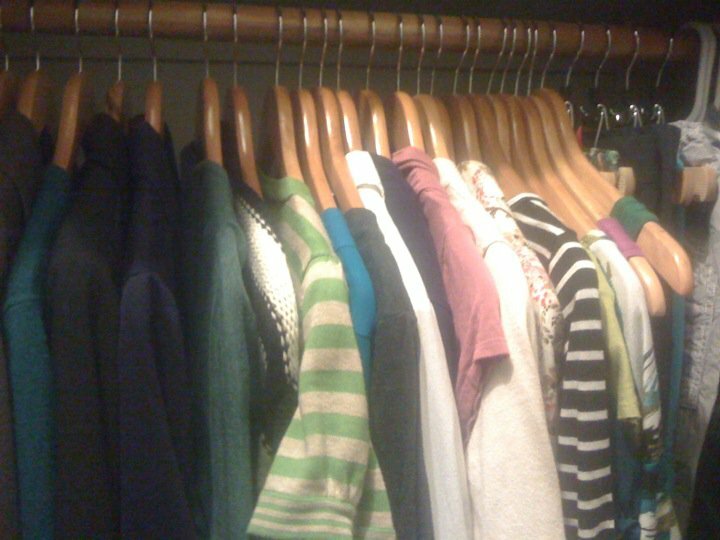 i bought some fancy new hangers, and the picture above is the result of my newly-made-over-closet. because, i want to lead with a spirit of freedom, and honesty. what about you? what’s your own personal confession? and how can we lead well by sharing both our brokenness and healing? first: thank you, thank you for all of the lovely facebook, twitter, and text birthday messages. i felt loved and celebrated and grateful. as you may know, i’m a big fan of birthdays and i especially love my ownbirthday. so after a very full day yesterday of eating at my favorite restaurants, and cheering on the cubs to an actual victory, and being with my family, i was a very happy girl. and, it was especially fun to watch my little niece experience her first cubs game. when you are born into our family, you are a cubs fan for life. there is no other option! and second: while i was out celebrating, the team from what’s in the bible announced it’s official release date! lori and i have been developing the content and writing the lessons for the last couple months, and we are thrilled to finally get it into the hands of children’s ministry leaders! dvd 1 releases november 15, while dvds 2-4 will release january 2011! a really unique feature that we’re right in the middle of developing is the mobile site for volunteers in which leaders can access the curriculum guides from their smart phones. we wanted to create a simple way for volunteers to prepare during the week and implement the lesson on sunday. i personally can’t wait to teach a lesson from the curriculum guide on my iPhone. way. too. fun. we are also creating an at home interactive site for families. we know that take home papers, even with the best of intentions, don’t always actually make it home. so we are creating small take home cards that point families to the online site where children and parents together can answer questions, interact with the characters and videos from the sunday morning lesson, and utilize further bible discovery resources. it’s going to be really fantastic! i’m in the middle of a million books right now. or 5. i love reading multiple books at the same time. in a strange way they sort of shape and speak to each other, making the reading experience fuller and deeper. i’m finally through all of my summer vacation books and am now moving on to a few heavier books. 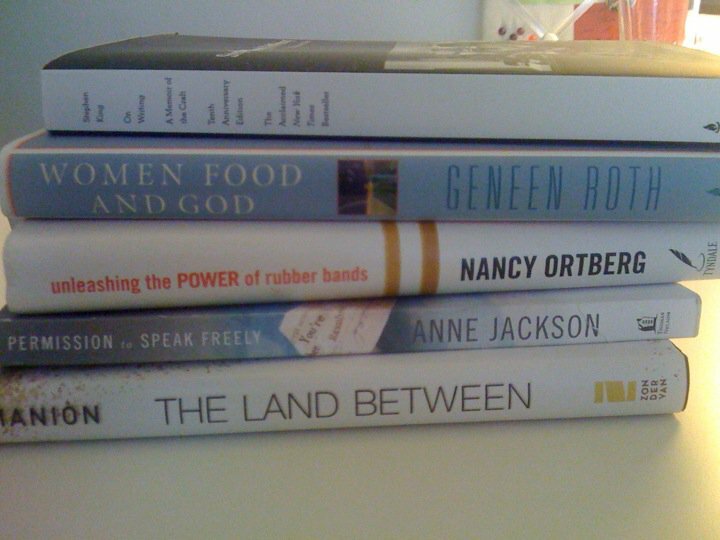 books on leadership, and fear, and food, and spirituality. you know, none of the subjects that should be read while lying on the beach! what are you reading this fall? the land between: finding god in difficult transitions [by jeff manion] i listened to jeff’s talk at the leadership summit and instantly knew that i wanted to hear more from him on the topic. after going through a somewhat rough transition in my own life, i realized that we don’t often hear christian pastors speaking about what it feels like to be “in between.” i love that jeff addresses this, and only hope that his book sparks the way for more conversation. and, he’s dan scott’spastor – so that makes him extra cool! permission to speak freely: essays and art on fear, confessions, and grace [by anne jackson] i’m a huge fan of anne jackson, specifically loved her first book “mad church disease” and love, love her blog flowerdustand this new book is so good and creative, and honest, and lovely to read. i’ll be posting a full review next week (9/7) on the book blog tour. can’t wait! women food and god: an unexpected path to almost anything [by geenen roth] i picked up this book last weekend at barnes and noble, and even just a few chapters in, i’m already loving it. it’s such a different book than i’ve ever read, and is really stretching my thinking on how our spirituality is often expressed by how we cook and eat. not necessarily a traditional christian perspective (and her language isn’t the cleanest) but i am really enjoying the book. unleashing the power of rubber bands: lessons in non-linear leadership [by nancy ortberg] yes, i’ve read this book before. and yes, i’ve blogged about the book before. here and here. this is my current favorite leadership book. when i was thinking about a leadership book to read with sandy, the new intern, this was the book i thought of first. i’m excited to digest and process it alongside sandy. it will be fun to see it from her perspective! on writing: a memoir of the craft [by stephen king] my husband just read this book, and oh-so lovingly, handed it over to me the minute he finished. the book really inspired kelly, and i’m hoping for the same! what does your book list look like today? oh! and if you’re interested in adding a free book to your list, my brother in law is giving away a copy of transition planon his blog! happy reading!